Quick! We need a sociologist! What’s harder: physics or sociology? We tend to lionize physicists. They’re the people who send spacecraft to faraway places, search for extraterrestrial life, and create modern wonders like virtual reality goggles. In short, many of us have physics envy. On the other hand, we tend to make fun of sociologists. What they’re doing seems to be nothing more than fancified common sense. I once heard a derisive definition of a sociologist: “He’s the guy who needs a $100K federal grant just to find the local bookie.” Few of us have sociology envy. But is physics really harder than sociology? I thought about this question as I listened to an episode of 99% Invisible, one of my favorite podcasts. The episode, titled “Built to Burn” is all about forest fires and how we respond to them. A general question is: Why do we need to put out forest fires? The specific answer is that we need to protect homes and properties and buildings. We assume that we have to stop the fire to protect the property. But do we? Enter Jack Cohen, a research scientist for the Forest Service. Cohen has studied forest fires intensively. He has even set a few of his own. 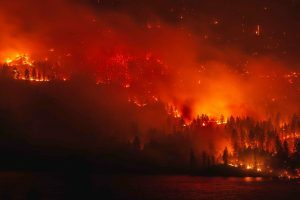 His conclusion: we can separate the idea of stopping wildfires from the goal of protecting property. Cohen’s basic idea is a home ignition zone that stretches about 100 feet in all directions around a house. By spacing trees, planting fire resistant crops, and modifying the home itself (no wood roofs), we can protect homes while letting nature takes its course. We no longer have to risk lives and spend millions if our goal is to protect homes. Cohen has done the hard scientific work. So, can we assume that his ideas have caught on like … um, wildfire? Not so fast. People seem to understand the science but are still reluctant to change their behavior. Cohen has done the hard science but the hard work remains. As Albert Einstein, the most famous physicist of all, said: “It’s easier to smash an atom than a prejudice.” Perhaps it’s time to develop some sociology envy.